What does the term “home” mean to you? Do you agree with Rubin that it’s one of the most important elements to your happiness? Do you have more than one place that you call “home”? Rubin observes that for most people, “outer order contributes to inner calm,” and many of her resolutions are aimed at clutter-clearing. Are you affected by clutter—or not? Rubin describes her struggle to conquer her fear of driving. Have you faced a similar challenge, when you’ve felt anxious about something that other people seem to take for granted (e.g., speaking in front of a group, flying, riding in a ski-lift)? Rubin writes, “Just because something is fun for someone else doesn’t make it fun for me—and vice versa” and “I can choose what I do, but I can’t choose what I like to do.” Do you agree? Or do you think you can teach yourself to enjoy something that initially you don’t find fun? What do you find fun? Do you have any “shrines” in your home? If you were going to make one, what would you include? Rubin describes the three types of happiness leeches: grouches, jerks, and slackers. Do you have happiness leeches in your life? Have you found ways to insulate yourself from the negative emotions these leeches can spread? If you decided to “suffer for fifteen minutes,” what big task might you tackle? 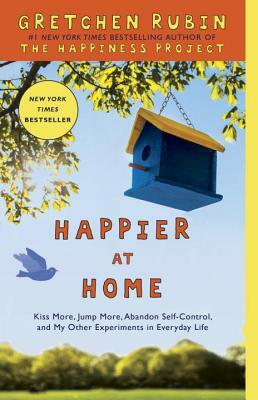 Happier at Home is packed with quotations. Which quotation resonated most with you? Rubin repeatedly emphasizes that she wants to find more happiness in her everyday life, and much of her happiness project is aimed at very small, ordinary aspects of her daily routine. Do you agree or disagree with this “little things” approach? If a new room magically appeared in your house or apartment, how would you use it? Is there a way you could make your current place reflect that use now? Did reading this book make you want to try any resolutions? Which ones? Rubin’s discussion of happiness is rooted in her own experience. She doesn’t address the experience of people in different countries, different eras, or different circumstances. Did you find this approach narrow? Or was it helpful to see the theories of happiness tested against the experience of a particular person?